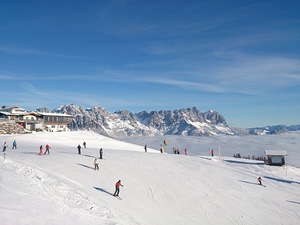 SkiWelt Wilder Kaiser – Brixental is one of the largest and most modern ski resorts in the world. One award after another is proof that here 280 km of ski runs, over 90 modern lifts and more than 70 refreshment stops make for winter fun which is simply “world class”. With 13 km of night skiing slopes and 11 km of floodlit toboggan runs day becomes night to let night-time thrill seekers sweep down perfect slopes and toboggan runs across the sea of lights in the valley. Whether with family, as a couple, with friends, alone or in a group at SkiWelt Wilder Kaiser - Brixental you’ll always get your moneys worth and find an offer to suit everyone. It’s white as far as the eye can see when it comes to snow conditions here. SkiWelt Wilder Kaiser - Brixental is particularly blessed with natural snow. In addition, 250 km of the 284 km of slopes can be completely covered with manmade snow; 120 km can be covered with snow in just 3 days! This is guaranteed by more than 1,700 snow machines in the ski area. From treeless summit slopes for carvers, to richly varied slopes for experts and family slopes bathed in sunshine, to the fantastic valley descents which go on and on, all the slopes are in perfect condition. Spectacular views and mountains of snow are guaranteed. Notwithstanding all the superlatives, which SkiWelt Wilder Kaiser – Brixental has already earned, it is the cosy atmosphere, warm hospitality and Tyrolean charm which set the tone. More than 70 of Austria’s loveliest ski huts and mountain restaurants, sun terraces and snow bars invite you to call in for a rest and a bite to eat. From a 'statistical point of view' you have an opportunity to do so every 3.3 km. This offer is valid from the beginning of the season until 21 December 2018 and from 16 March 2019 until 31 March 2019. Only pre-condition: A parent purchase a SkiWelt ski pass which is valid for at least three days - so kids 15 and under (born 2003-2012) ride for free during the same period. 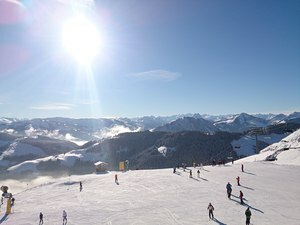 From the beginning of the season until 21 December 2018 and from 16 March 2019 until 31 March 2019, ski for a particularly good price at SkiWelt Wilder Kaiser-Brixental for a 2 - 14 day per diem from selected vendors. Beginning 09 January 2019, all ladies may ride for an adolescent tariff on Wednesdays for a day or partial day! Beginning 10 January 2019, all men may ride for an adolescent tariff on Wednesdays for a day or partial day! The Winter Opening is celebrated in style at SkiWelt Wilder Kaiser - Brixental following the motto "perfect slopes, live music and so much fun!" This year, for the first time we even celebrate on TWO WEEKENDS! New Year’s Eve in the Mountains will be taking place on the Hohe Salve in Hopfgarten. From 7:00 pm, you can take the cable car up to the Salvenalm and the Tenner Stadl. Then at midnight, an amazing fireworks display begins. Finally, head back down to the valley by cable car or on foot. 2 weeks full of parties in the whole SkiWelt Wilder Kaiser - Brixental. Daily live music at the SkiWelt huts, DJ’s, perfect slope conditions and great offers await you! Snow, fun and free guided skiing! In March, a non-stop party atmosphere comes guaranteed. From traditional folk music, DJ's, electro, jazz and boogie-woogie to rock music and the very latest hits, there’s a sound to suit all musical tastes! Just had a week in Ellmau, fantastic snow, great conditions at all levels due to the previous heavy snowfalls, was very cold in the mornings especially on lifts. Great for intermediates with plenty of choice. I have skied here quite a few times and never get bored. A lot of linked resorts i.e. Soll, Going, Itter, Westendorf just to mention some. The funicular railway in Ellmau is a very quick link to all of other resorts (depending on ability). Accommodation is varied to suit all pockets. We did stay in a cheap catered chalet exclusive to Crystal (very poor). This year we went half-board with Crystal, could not complain. Overall, a great village for skiing, limited for non skiers, but always a great atmosphere.